Named for the first phytobacteriologist, Erwin Smith. It is a rod-shaped bacteria and is a gram negative bacterium related to E.coli, Shigella, Salmonella and Yersinia. These species produce enzymes that hydrolyze pectin between individual plant cells. This causes the cells to separate, a disease plant pathologists call plant rot. 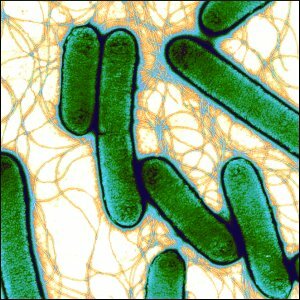 This bacteria is a plant pathogen with a wide host range (carrot, potato, tomato, leafy greens, squash and other cucurbits, onion, green peppers, etc. ), able to cause disease in almost any plant tissue it invades. We dealt with it on aloe v era crops in Costa Rica where fields did not have perfect drainage. It is a very economically important pathogen in terms of postharvest losses, and a common cause of decay in stored fruits and vegetables. Decay is often referred to as bacterial soft rot (BSR). Most plants or plant parts can resist invasion by the bacteria, unless some type of wound is present. Controls include 3% hydrogen peroxide and the commercial product Plant Wash. Plant Wash is also excellent to prevent rot on harvested and sotred fruits and vegetables.